Streaming movies and TV has undeniably made our lives a lot more convenient, and you’ll be happy to learn that it’s actually making the world a lot safer, too. It always seemed like just a sad fact of life that drivers speeding back to their homes to watch a rerun of the hit NBC sitcom Frasier would cause several hundred thousand fatalities in America every year, but with the advent of digital streaming services, the number of fatal car accidents caused by people rushing to get home to watch Frasier has decreased by 80 percent over the last decade. It’s amazing how technology can solve the problems we all assumed we’d just have to live with forever! 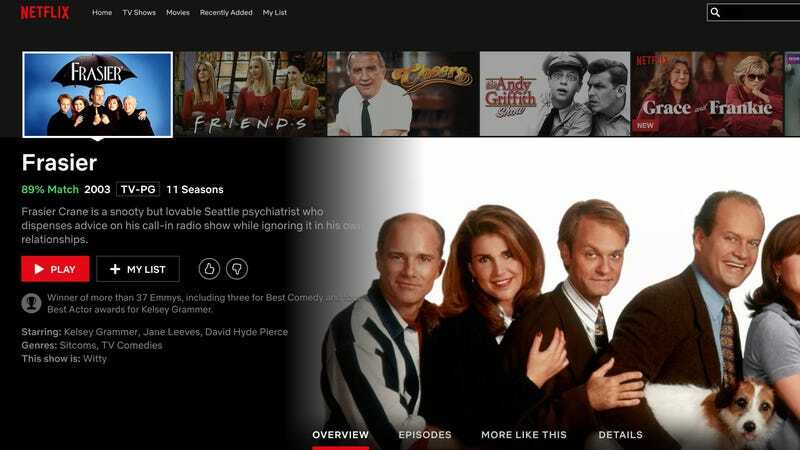 Thanks to streaming services like Netflix and Hulu, drivers who would normally be blowing through red lights and recklessly skidding around blind corners to catch Frasier’s opening jingle and pithy title cards are now driving safely and carefully obeying traffic laws, all because streaming has given them the freedom to start an episode of Frasier at their own pace. Sure, there are still going to be a handful of drivers who die in their mad dash to get home for the Hallmark channel’s 3 a.m. Frasier block, but thousands who would have otherwise met their fate in a fiery wreck have been able to come home safe to their families and an instantly accessible library of Frasier episodes that they can access as soon as they get home from work. To put this dramatic increase in road safety into perspective, in 1996, over 250,000 pedestrians were struck and killed at crosswalks by drivers barreling past stop signs in their hurry to enjoy Frasier’s clever repartee with his working-class father and Niles’ “will they or won’t they” romance with Daphne. In the past year, only 45,000 pedestrians were killed in Frasier-related collisions! The impact of streaming on the wellbeing of the American public cannot be overstated. These platforms are bringing our roads into a brighter, safer future. Kudos to all the companies that made this possible by offering Frasier on demand, and keep up the good work!